That classic spirit that built a Whiskey empire. There has been Whiskey made on the site of the Buffalo Trace Distillery in Frankfort, Kentucky for more than two hundred years. The first distillery operation that can be continuously traced to Buffalo Trace was started in 1812 by Harrison Blanton (yes, that Blanton). He sold the operation in 1870 and it was renamed the Old Fire Copper (O. F. C.) Distillery. It has been bought and sold many times over the intervening decades. 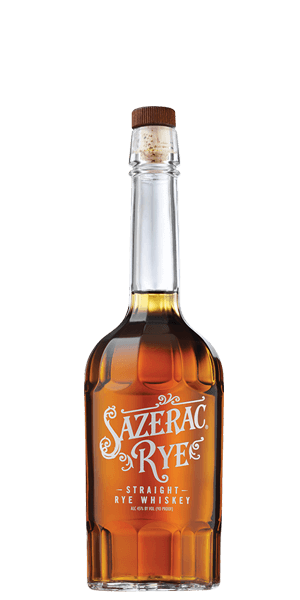 But Sazerac has owned the property since 1992 and it has become the flagship distillery for New Orleans-based Sazerac, producing a wide range of Whiskies and spirits. Sazerac Rye is the product that built the company. Although the original Sazerac cocktail was made with Cognac, it really took off when they swapped in a new house Whiskey — Sazerac Rye. Production was consolidated at the Buffalo Trace Distillery — meticulously following the same formula. The surprising thing is that this sought-after classic is still such a great value even though it is hard to get. Jim Murray of The Whiskey Bible raved about its “crispness” and gave it a 94.5 rating. Wine Enthusiast awarded a score of 95 points and rated it a “Best Buy.” It won gold medals this year in both LA and San Francisco. We told Uncle Flaviar to keep it all for us here at the office but he insists on sharing the love. What does Sazerac Straight Rye Whiskey taste like? The Flavor Spiral™ shows the most common flavors that you'll taste in Sazerac Straight Rye Whiskey and gives you a chance to have a taste of it before actually tasting it. Vanilla, clove, anise, and pepper. Cinnamon, crumb cake, more black pepper, and candied orange zest. Smooth, crisp, and dry with anise and orange-blossom honey. This is an essential to any home bar. Many of my friends that don't like to sip whisky, love this. It's got a really drinkable flavor. I sip on this consistently. also makes for a great mixed drink. Love the price, smooth flavor short finish. Another good buffalo trace product. Not bad at all. A bit sweeter than the Templeton, but quite serviceable. Makes a good old-fashioned. This is the gold standard for mid level rye whiskey. If you want better you have to spend more and that extra money might not deliver. This is the classic go to rye! As with many of the other reviewers this is a very tasty rye... not a typical rye. Very smooth and great for the price. It's a hard find here in Nashville. Great!! Not usually a rye fan. This was good and especially for the price! Great add to the home bar. The best rye I’ve tasted. Truly makes a top notch sazarac! I'm more into wheat than rye however this is certainly my favorite rye. Probably because it is incredibly smooth with great flavor at a great price. Always keep a couple in the cabinet. It is a very good, crisp, Straight Rye Whiskey with a crisp birth; a bold life; that leads to a smooth & dry death with notes of flint, anise & orange-blossom honey. EASY DRINKING AND BALANCED FOR A RYE. A hot mess. will be great for cocktails. needs more time in the barrel to be smooth enough for my taste. Don’t have a bottle, but got it neat at Big Whiskey’s in Spfld MO. As a novice rye drinker, really impressed. anise was the flavor I couldn’t put my finger on at first. I really enjoyed it. True form rye, pretty good tasting for $30 a bottle. The anise flavor is a nice surprise. Starts out sweet then pepper and spicy settles in. Very smooth. Very good Rye for the famous Sazerac Cocktail and the Vieux Carre. Decent price point. Very enjoyable, nicely spiced! Great straight or as a Manhattan. Spicy and peppery vanilla with cloves. Fantastic. Medium finish, but very, very drinkable. This one will definitely have you coming back for more. Great value for the price. Fall in a glass- smooth and spicy, full of flavor. Very good neat- excels in a cocktail with some apple cider & cinnamon stick. One of the best ryes I've ever tasted. This one is a must have at all times. Very sweet and smooth for a Rye, excellent value when you can find it. This is the first whiskey my wife ordered neat so it must be good!! Sweet and delicious, I wish I saw it around more often. Then again, that might be dangerous. It's definitely a different flavor than the regular Whiskey I usually drink. I discovered the other day I like it in my coffee better than Maker's or Buffalo Trace and it goes well with cheddar and sour cream flavored chips. Smooth and warm. Great neat, in a Manhattan or in namesake cocktail. One of my favorites for sipping on the deck. A Sazerac cocktail tastes the best with the true Sazerac Rye! Bottoms up! Great rye whiskey, nice flavor profile. Easy to drink neat or on the rocks. My Dad was a Rye drinker since his twenties. (Mostly mixed in simple Manhattan on the Rocks) On the recommendation of a local store, I picked-up a bottle of this stuff for him for Father's Day - He told me that this was "the best damned Rye that he'd ever had" He liked that it was smooth and complex, but still less sweet than Bourbon (which is WHY he was a "Rye man", and he was not just saying this because he was my Dad...) So, take it from an old-school, long-time Rye drinker - this one BELONGS in your "hooch cabinet"! I really enjoy this rye. Great on the rocks and very smooth. For the price, there isn't anything better period. The only rye I like better at all is the Basil Hayden Dark Rye (blended with canadian rye and some port) but it's twice the price. My favorite rye. Smooth, yet still has the spiciness of rye. Great Rye at a great price. Love this! One of my all time go-to’s straight!!! Almost gave it 10 stars because of value. Very inexpensive bottle for the quality. As many have noted the balance on this is great. Very smooth. Can be enjoyed on its own. Loves this rye, very balanced sweetness and subtle vanilla notes. Good depth while somehow very drinkable so watch out. Very good in a Sazerac cocktail, no irony intended. Blends well with the Peychaud’s bitters. Long finish for a mid-price rye. Smooth and flavorful. I enjoyed in neat but when combined with a modest number of ice cubes, it was even better. I enjoyed the flavor. I use this to make Whiskey Sours now instead of Woodford Reserve. Great flavor. Not too expensive. Perfect rye for its namesake drink. Hard to get here in Ohio, but worth the effort when you can get a bottle. Not sure if I'm a rye guy. The depth of flavor was great and no single thing was off putting, just not my cup of tea. An old school rye that is always dependable, great for mixing or rocks. Best served over ice; BT always delivers superb product. This stuff is pure gold. Simply amazing. Quite spicy, but wonderfully balanced with a pure cornucopia of spices like clove and vanilla. A medium-long finish adds to the velvety mouthfeel. My new favorite dram, and it has quickly become a staple in my repertoire. Perfection in a glass. Very smooth over ice. This is now a staple in my home bar. I really loved the pepper and anise. It goes well with cola, but I have been mostly drinking a dram with one ice cube. Can't purchase from flaviar, live in AR to bad ?? ?